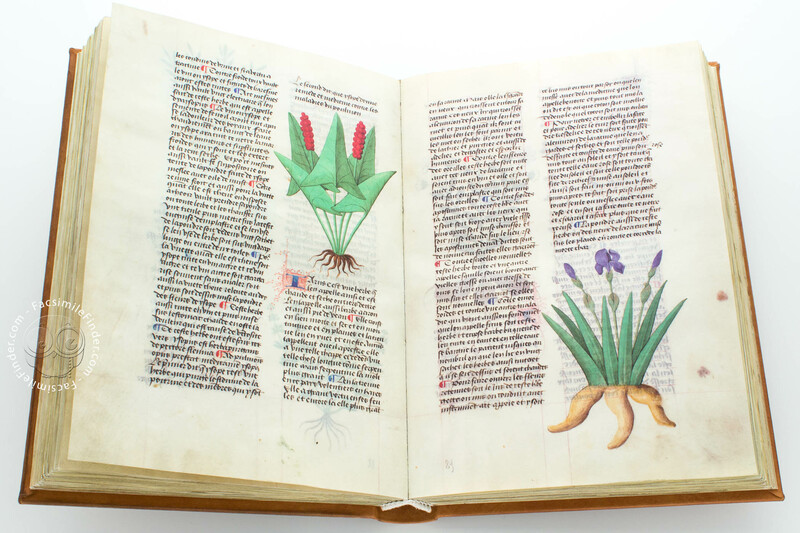 This is the most refined of the two Herbaria written in the 15th Century, and preserved in the Biblioteca Estense Universitaria di Modena (the other one being the Tractatus de Herbis). 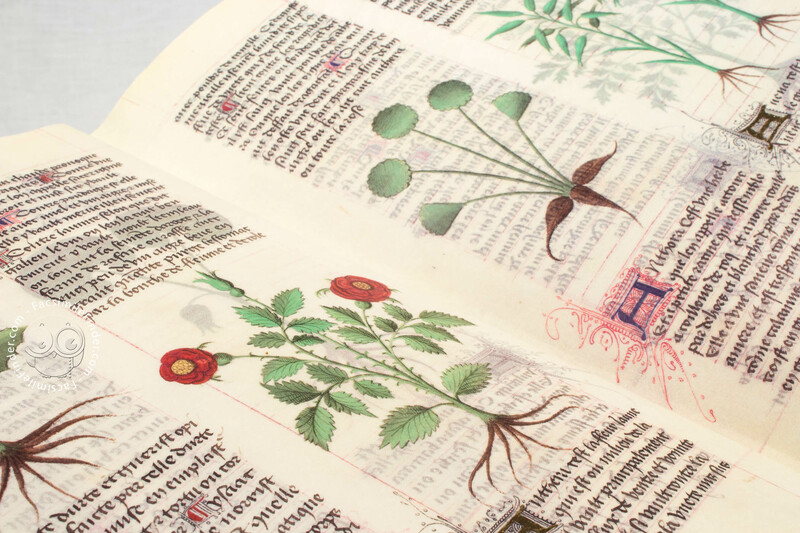 Composed in ancient French with a fascinating Gothic script (bastarda or lettre bâtarde), the manuscript describes more than 500 plants and animals. 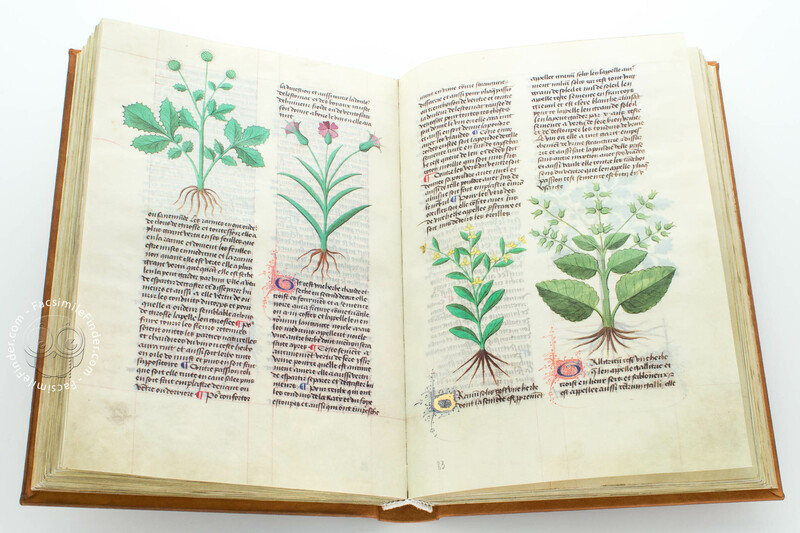 It’s closely related to the work of Pedanius Dioscorides, active in the 1st century, and to the scientific production of the Schola Medica Salernitana, which worked on the consolidation of the Greek, Latin and Arabic schools of medicine in the 12th century. 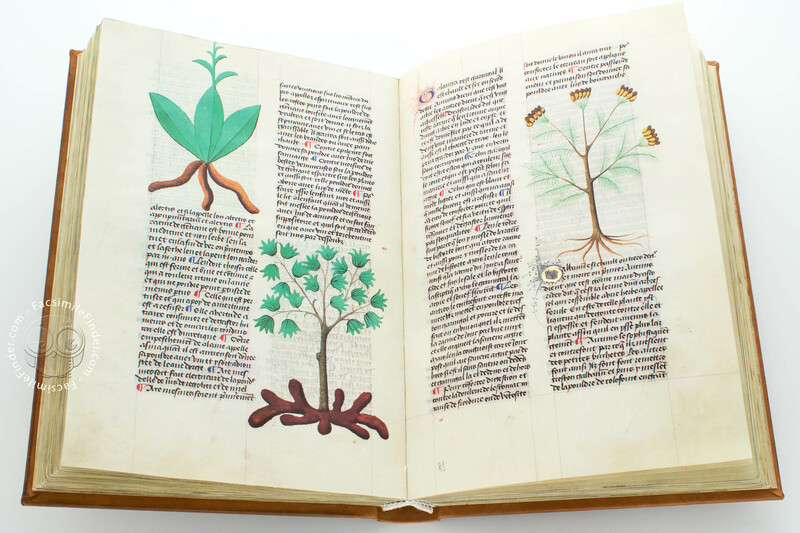 The manuscript, produced around 1470, has been a part of the collection of the Biblioteca Estense in Modena since the second half of the 18th century. 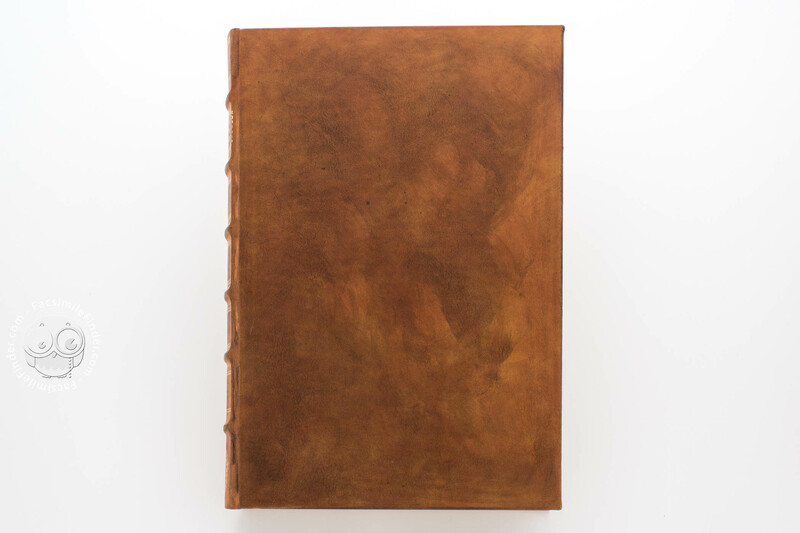 It’s bound with the leather cover typical of the period during which Girolamo Tiraboschi was director of the library. 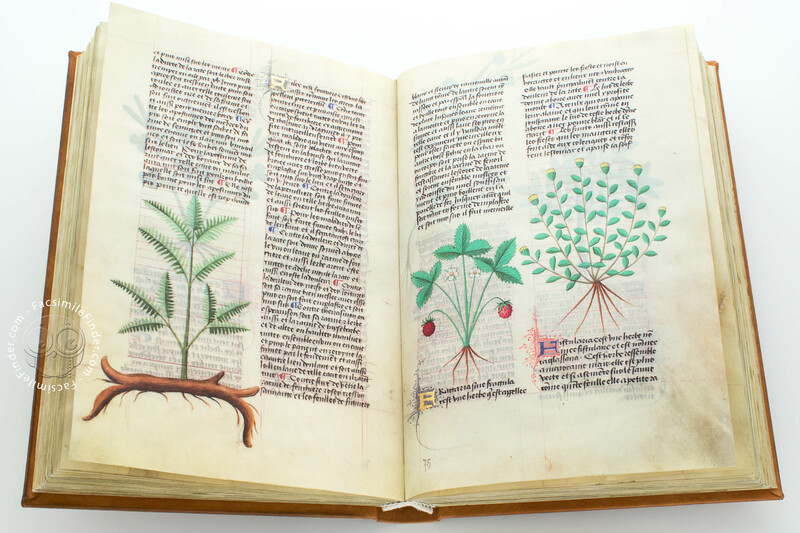 The author organizes the manuscript in alphabetical order (based on the first letter of the name of the plant) and accompanies each text with the depiction of the plant. 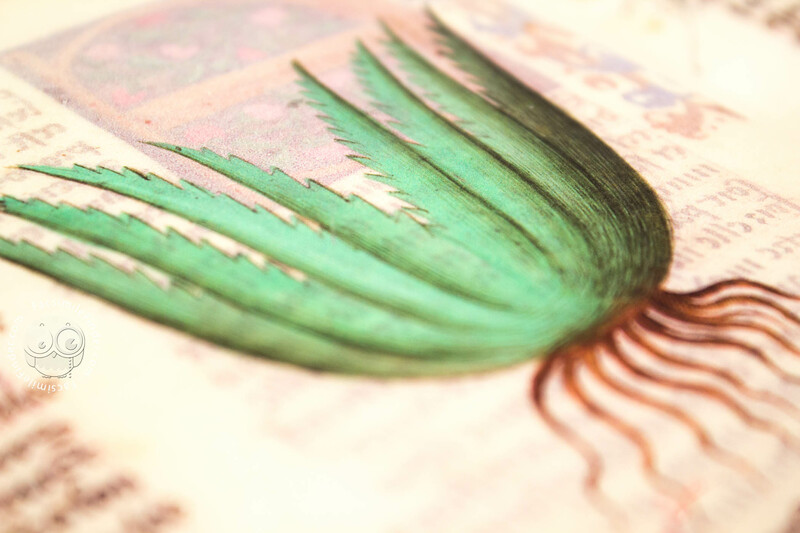 The richness of this Codex is proof that it was made for the most illustrious people of the time. The miniatures, all made by a single artist, are very realistic, especially those depicting the herbs. 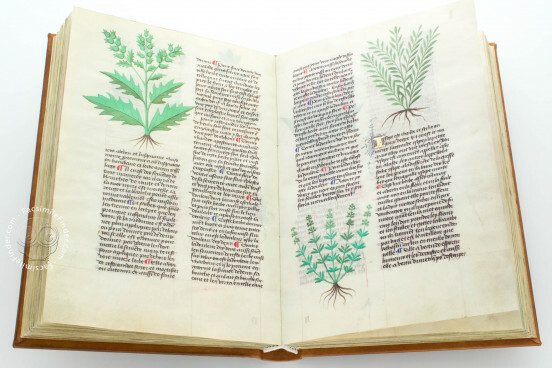 The medical plants and remedies discussed by the author are more or less 500. 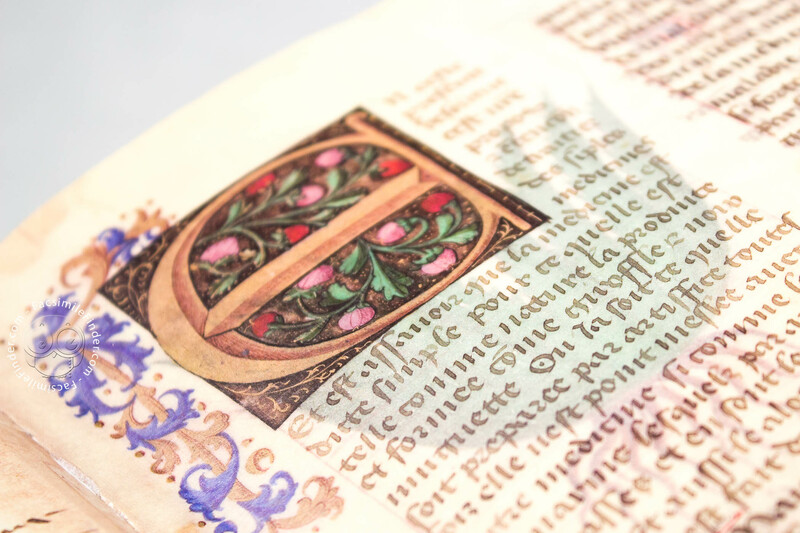 The pages are richly illuminated, and are decorated in gold 23ct. There are many images of plants, herbs, flowers, animals, and farm scenes. 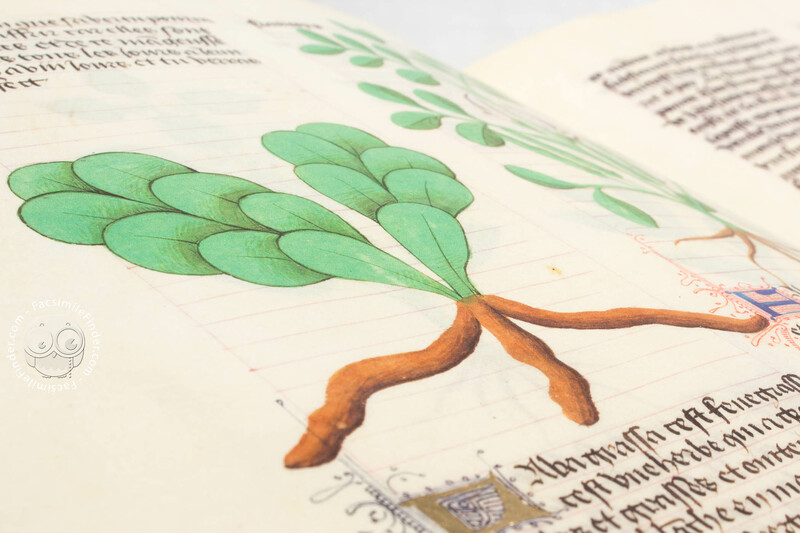 The manuscript contains 391 images: 355 are of plants, flowers, and roots; 26 are of animals or minerals; and 10 are illuminated scenes of natural life. D’Urfé appears among the owners of the book. The name “Jehan Duboys” appears in first pages of the manuscript: he was probably the copyist, but he also added a number of comments to the text during its replication. 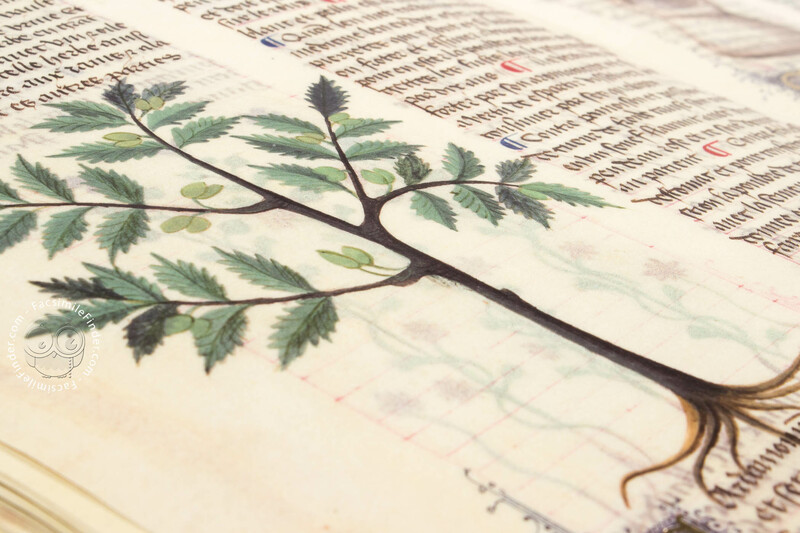 The manuscript is probably derived from the British Library Egerton MS 747 (Otto Pächt). Brown leather binding. On the spine, the title "Dictionar gallicum Herbarum" is blind-tooled in gold. 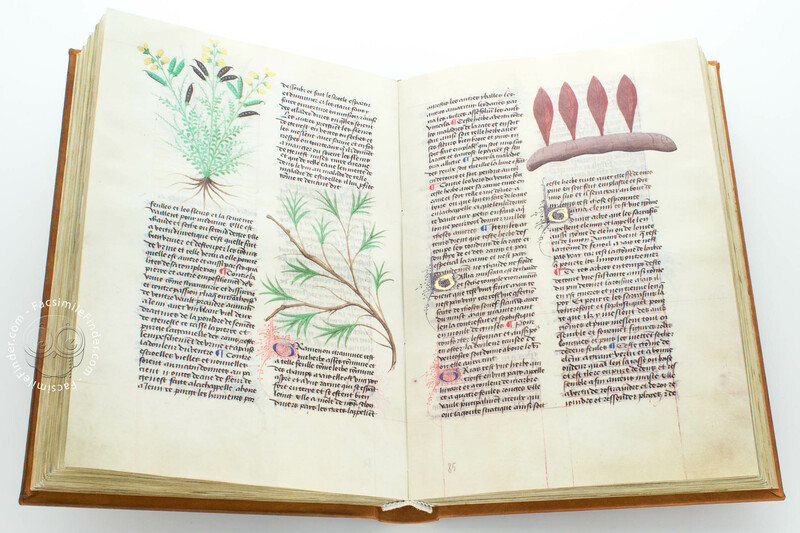 Manuscript book on parchment − 29.2 × 20.5 cm − 340 pp. 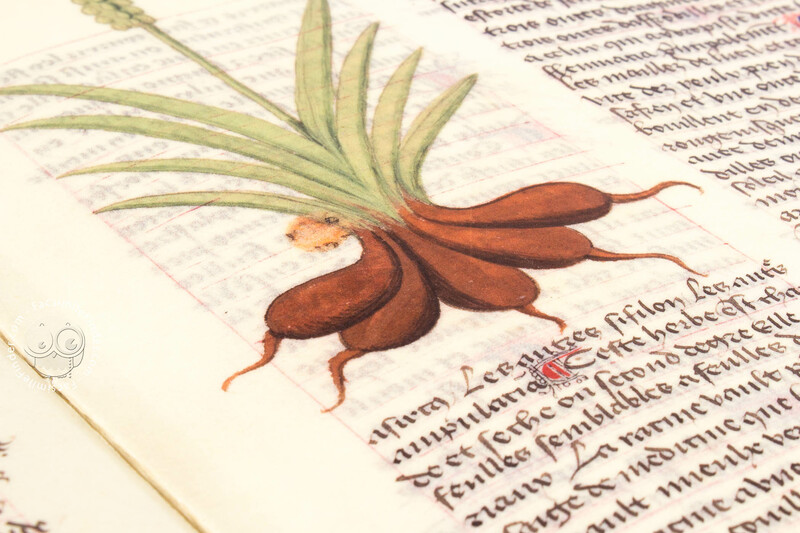 Full-size color reproduction of the entire original document, Herbolaire: the facsimile attempts to replicate the look-and-feel and physical features of the original document; pages are trimmed according to the original format; the binding might not be consistent with the current document binding. 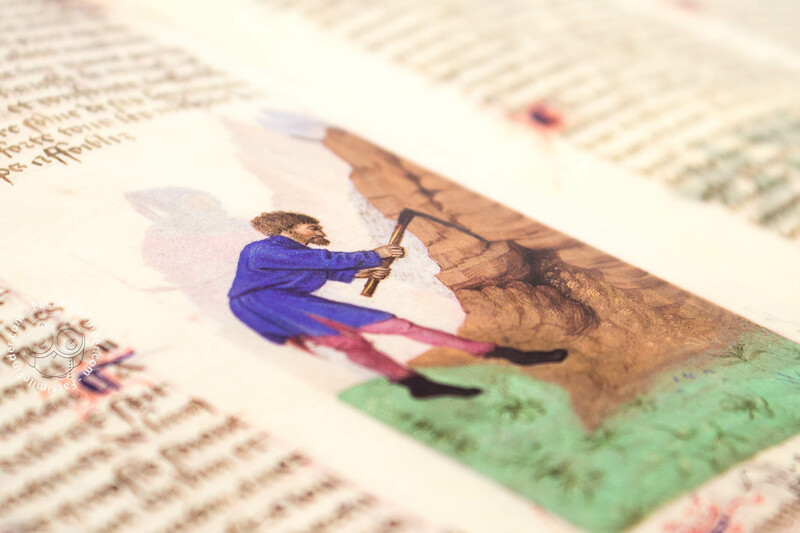 Each page of the facsimile is aged individually. 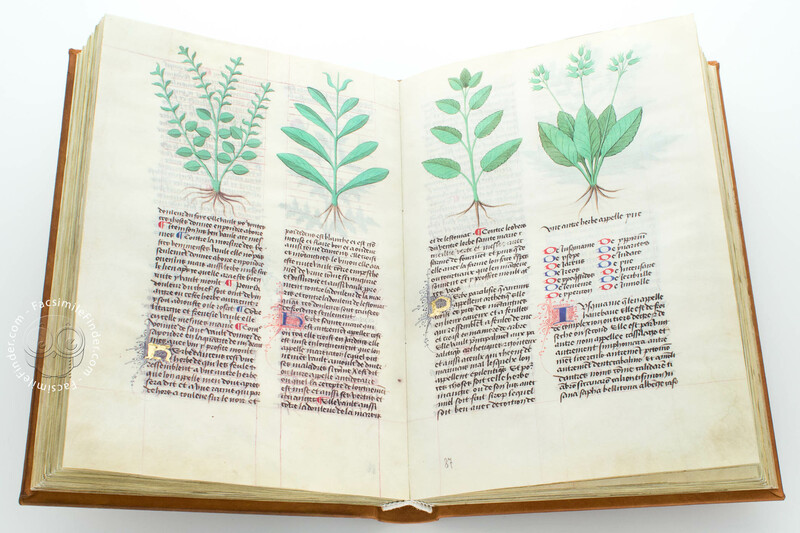 The commentary volume contains a historical note on herbals, the complete description of the manuscript, the full transcription of the French text and its translation into Italian, and a detailed description, in modern botanical terms, of the plants depicted in the manuscript. 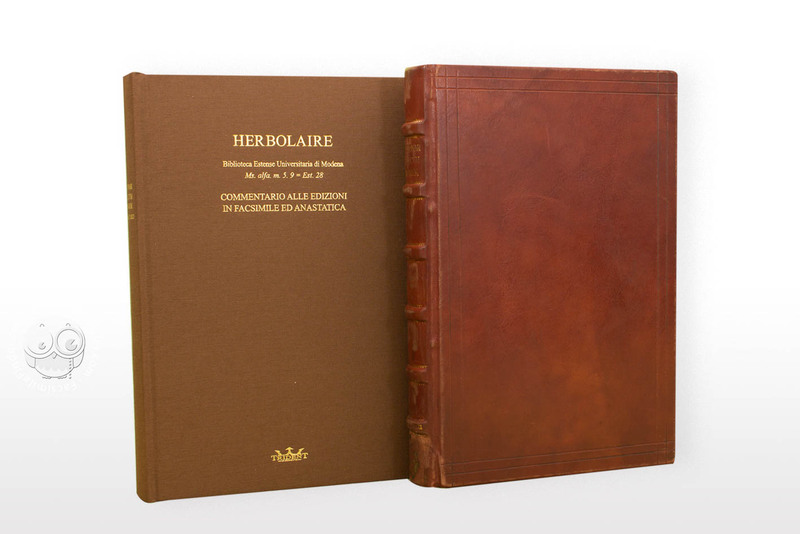 A faithful replica of the original manuscript binding, in brown leather.